Almost everything I thought I knew about my paternal grandfather’s early years in the United States was wrong. And I am happy that I was wrong. I knew that Julian Prokopowicz, age 19, planned to stay with the Linga family, his friends from Kiwance village in Radun parish, when he immigrated to America and reached his destination of Worcester, Massachusetts. The April 1914 passenger list for the SS Koln showed him traveling from Bremen, Germany, to Boston alone. His parents and siblings remained in Russian Poland, and he never did see them again. I was right about that much. What I recently learned, however, is that members of his mother’s family had immigrated more than a decade earlier and had apparently maintained communication for all those years. I discovered this through Massachusetts records that have been digitized and made available online at the FamilySearch website. A single record in a Massachusetts vital records database (“Massachusetts Marriages, 1841-1915”) provided a single detail that gave me a whole new look at my grandfather’s first year here. This new information unlocked the secrets held in a set of three related wedding-day portraits that I received in 1998, one of several dozen photos left behind, ignored and unwanted, in a small black suitcase after my grandmother, Anna Blaszko Prokopowicz, died in 1976. My grandfather, Julian, died much earlier, in 1951. The large wedding portrait (shown below) is typical of its era: a seated bride and groom flanked by a group of nine beautifully attired but solemn-faced persons who shared in the occasion. A smaller photo shows the bride and groom standing alone. Inscribed in pencil on the back is this note in Polish: “Pamiontka szlubu Pan Jozef Orszula Szlachciuk”—that is, “A remembrance of the wedding of Mr. Jozef [and] Urszula Szlachciuk.” A third photo shows three young men standing together: one unidentified at left (holding a lit cigarette in his white-gloved hand! ), Jozef Szlachciuk, and my grandfather, Julian. The only person recognizable to me in the photos was my grandfather, looking very young at age 20. The Szlachciuk name meant nothing to me; I guessed the groom was a friend—likely a close friend—of Julian’s. The photos were made at the studio of Geo. T. Elson of Maynard, Massachusetts; his name is engraved on the tan and brown cardboard mats on which the photos are mounted. About five years ago, in browsing through this collection of old photos, I tried to find some information about Jozef Szlachciuk. He appears with a wife and children in the 1930 U.S. Census for Rhode Island. I thought idly that someday when I had time, I would try to locate one of the Szlachciuk descendants and offer them the photos. 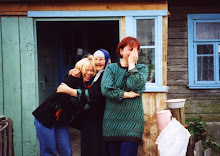 (In fact, I have four other small postcard-type photos featuring Jozef and Urszula.) I assumed that the Szlachciuks were not related to me. And then I put the photos back in storage. A few weeks ago, I came across the Szlachciuk wedding pictures and decided to research the surname again. So much more genealogical information is online now than there was five years ago! I entered the surname on FamilySearch, and was happy to get a result, though the name was indexed as Joseph Szlachcink. (Polish surnames are misspelled and misindexed more often than not in U.S. records, often so grossly incorrect as to be unrecognizable. A handwritten “u” misinterpreted as “n” wasn’t too far off, all things considered.) The digitized image was a page detailing “Marriages registered in the town of Maynard for the Year Nineteen Hundred and fifteen” (p. 631 in the Massachusetts state volume). “Marriage No. 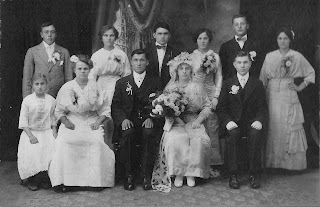 76” records the September 26, 1915, wedding of Joseph Szlachciuk, 23, and Ursula Przyjemska, 18. It was the first marriage for each of them; they were both residents of Maynard, both born in Poland. His occupation was “Laborer” and hers, “Mill Op.” (that is, “operator”). Joseph’s parents are listed as Stanislaw and Mary Krasz[e]wski Szlachciuk. Ursula’s parents are identified as Casimir and Ellen Bohdan Przyjemski. The priest who performed the ceremony was Reverend Francis Jablonski of Maynard. The date of record was September 27, 1915. One detail in that record stopped me in my tracks: Ursula’s mother was Ellen Bohdan. (This is a surname that is variously spelled Bogdan, Bohdan, and Bahdan in Polish and Russian records.) Julian’s mother was Anna Bogdan, or Bohdan. I had found the 1870 baptismal record of Elena Bohdan in the Radun parish microfilms that I use for research at my local Family History Center. Elena Bohdan was born in Odwierniki, the same village that Julian claimed as his birthplace on his World War I draft registration card in 1917. It seemed more than coincidence that the bride’s mother was a Bogdan from Odwierniki, a village of only six houses in that era. According to the somewhat earlier 1852 Radun parish census, two of those six houses in Odwierniki were inhabited by Bogdan families, one headed by Mateusz, the other by his brother, Jan (or Iwan, in the Russian-language records). Elena and Anna Bogdan were almost certainly either sisters or first cousins. So Julian Prokopowicz appears in the Szlachciuk-Przyjemski wedding photos not because he was a friend of the groom, but because he was a cousin of the bride. If Elena and Anna were sisters, then Julian and Urszula were first cousins; if the two women were first cousins, then Julian and Urszula were second cousins. Either way, they were cousins. Intrigued by the details provided in the town of Maynard’s civil record of the marriage, I wanted to know more: who were the witnesses? That information, along with the bride’s and groom’s villages of origin, would have been recorded at St. Casimir Church, where the wedding ceremony was performed. Established in 1912 to serve Maynard’s sizable Polish Roman Catholic immigrant community, St. Casimir Parish closed in 1997; its records are now held by St. Bridget Parish in that town. I contacted the parish office, and learned that the witnesses were Julian Prokopowicz and Jozef Fabrycki. It is, of course, speculation on my part, but I would like to believe that the relationship between Julian and the Bogdan-Przyjemski family was so close that they chose to recognize him with this honor. So he was not alone in America, as I had assumed all these years; he did have family here, and knowing that makes me happy to have been wrong. The question now is, were Elena and Anna sisters, or cousins? Anna’s baptismal record would clarify their relationship. I wish I could time-travel back to Odwierniki: Would I see a copy of that 1915 wedding photo on display in the home of my great-grandparents, Kazimierz and Anna Bogdan Prokopowicz? Would I see Anna’s face light up when she looked at it? Would she take comfort in knowing that her son Julian, some 4,200 miles away, had Elena (his “Ciocia Helena”) watching over him in his new American life? I’d like to think so. Jozef Szlachciuk and Urszula Przyjemska were married September 26, 1915, at St. Casimir Church in Maynard, Massachusetts. This group portrait was made at the Geo. T. Elson Studio in Maynard. 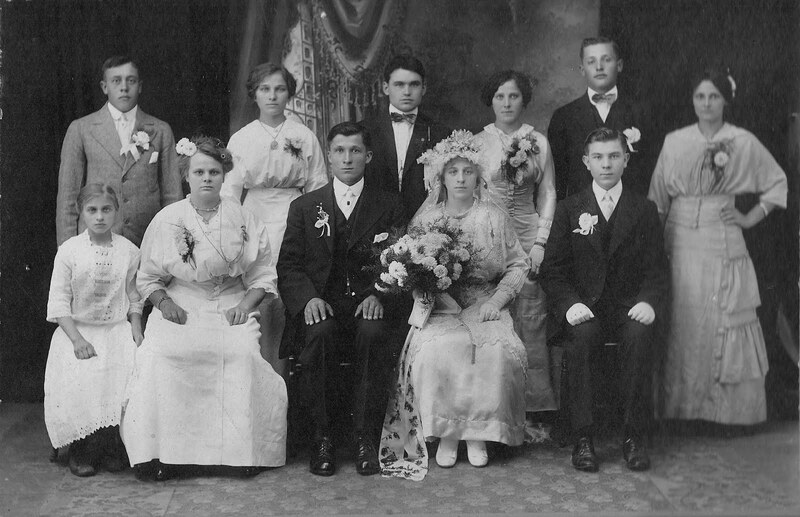 Seated at far left is, I believe, Anna Przyjemska, about 12 years old, the younger sister of the bride; an unidentified woman; the groom, Jozef Szlachciuk, age 23; the bride, Urszula Przyjemska, age 18; and marriage witness Jozef Fabrycki. Standing at far left is my paternal grandfather, Julian Prokopowicz, age 20, the bride’s cousin and another witness to the marriage. The others are unidentified. Fabulous detective work! Congratulations on untangling part of your past. I just wanted to thank you for your attention to detail and share some of my own family story, which tangentially ties in. You credited my great grandfather who founded that photography studio in Maynard MA. I was looking for something mostly unrelated, and the tag, with my grandmother's maiden name, on your ancestors wedding photo, caught my eye. I will have to check with my dad, but I think his grandfathers full name was Geoffrey Tomas Elson. He was a British immigrant, who had married his 2nd cousin and moved to the U.S. because the family in England did not approve. (or so the family myth goes) They had 9 children in Maynard. Unfortunately, he became an alcoholic in his middle to old age, and the photography studio had a bad fire, and I don't know much eles about them, both of them and most of their children having passed decades before I was born. However, I too have looked at photos with the same "Geo. T. Elson Studio, Maynad Mass." stamped on the back edge. When my grandmother passed away, a few slightly illicit photos she had kept hidden away, which she must have produced at his studio in her late teens or early 20's, were found. I've toyed with putting them on the web someplace, as much as she kept them hidden away, her younger self was at least a closet exhibitionist, by early 20th century standards. I'll try and remember to drop you a link if I ever make them public.